I was furnished with a mat to Sit on, and one man Set about prepareing me Something to eate, first he brought in a piece of a Drift log of pine and with a wedge of the elks horn, and a malet of Stone curioesly Carved he Split the log into Small pieces and lay'd it open on the fire on which he put round Stones, a woman handed him a basket of water and a large Salmon about half Dried, when the Stones were hot he put them into the basket of water with the fish which was Soon Suflicently boiled for use. it was then taken out put on a platter of rushes neetly made, and Set before me they boiled a Salmon for each of the men with me, dureing those preperations. The cooking methods for wild game are the same as those for domestic animals and in fact the modern methods of cooking were derived from cooking wild game. On occasion it is enjoyable to step out into a less controlled environment and cook wild game. The methods that are most suitable for this is smoking, grilling, Dutch Oven, and open fire camp cooking. It is important, however, not to minimize any safe food handling practices. Keeping meat at <40 degrees F before cooking, cooking meat to the proper temperature, and maintaining clean work areas is essential to prevent spoilage and contamination. For more information go to Food Safety. 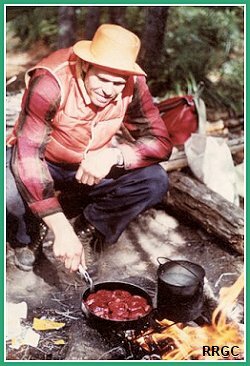 Other methods for cooking/preserving wild game includes canning, drying, and corning. These methods are not covered in this website with the exception of drying to make jerky which is discussed under smoking. For more information on preserving food go to the Oregon State University Extension website. Barbecuing and grilling are very similar and the same equipment can be used for either method. The equipment for smoking usually requires a different design which allows for indirect heating and good circulation of smoke over the meat. Grilling is use for more tender cuts and the meat is cooked over direct heat at a high temperature. Barbecuing is used for tougher cuts that require longer cooking times and indirect heat. Camp cooking over an open fire is normally done with direct heat and high temperatures similar to grilling. Smoking involves lower temperature, indirect heat and longer cooking times. Wood smoke flavors can be accomplished during grilling, barbecuing, or smoking. For more information relating to smoking, grilling/barbecuing, Dutch oven and camp cooking click on the above links.